[164 pages report] The gluten-free products market was valued at USD 4.18 billion in 2017; this is projected to reach USD 6.47 billion by 2023, at a CAGR of 7.6% during the forecast period. 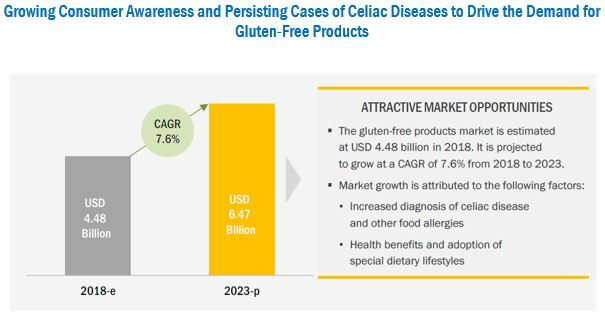 Rise in awareness about celiac disease and adoption of special dietary lifestyles are the major factors driving this market. The key players were identified through secondary sources, such as the Food and Drug Administration Organization (FDA), the European Food Safety Authority (EFSA), Gluten-free Certification Organization (GFCO), Gluten-free Standards Organization (GFSA), and the National Foundation for Celiac Awareness Gluten-free Certification Program (NFCA), while their market shares in respective regions were determined through both, primary and secondary research processes. 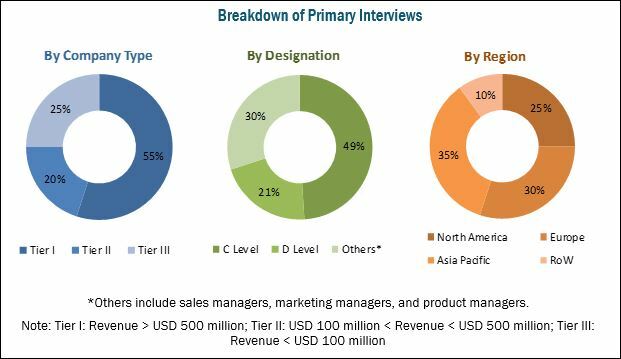 The research methodology included the study of annual and financial reports of top market players as well as interviews with industry experts (CEOs, VPs, directors, and marketing executives) for key insights (both quantitative and qualitative) for the gluten-free products market. The various contributors involved in the supply chain of the gluten-free products market include gluten-free product distributors & suppliers, R&D institutes, and gluten-free product manufacturing companies such as The Kraft Heinz Company (US), The Hain Celestial Group, Inc. (US), Pinnacle Foods Inc. (US), General Mills, Inc. (US), and Kellogg Company (US). Other contributors included retailers and government bodies & regulatory associations, such as the Food Standards Australia New Zealand (FSANZ), the Food and Drug Administration (FDA), and the European Food Safety Authority (EFSA). This research report categorizes the gluten-free products market based on type, distribution channel, and region. 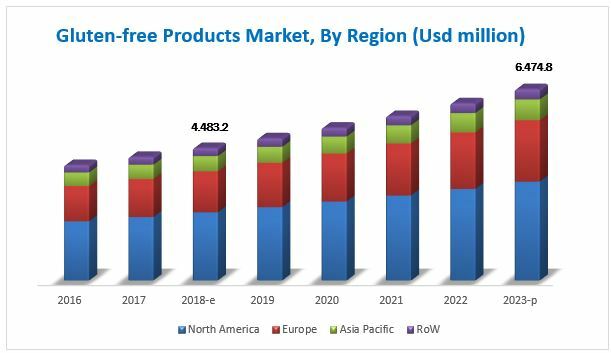 The gluten-free products market is estimated to be valued at USD 4.48 billion in 2018 and is projected to reach USD 6.47 billion by 2023, at a CAGR of 7.6% during the forecast period. The market is driven by the rising awareness about the diagnosis of celiac disease and food intolerances among consumers. The gluten-free products market, based on type, has been segmented into bakery products, snacks & RTE products, pizzas & pastas, condiments & dressings, and others. The market for bakery products is estimated to dominate in 2018, while the snacks & RTE products segment is projected to be the fastest-growing during the forecast period. Companies have identified that gluten-intolerant consumers due to their busy lifestyles and increased snacking requirements require quality snacks & RTE products. This has encouraged manufacturers to venture into the gluten-free snacks & RTE products category. The gluten-free products market, by distributional channel, has been segmented into conventional stores, specialty stores, and drugstores & pharmacies. The conventional stores segment is estimated to dominate the market in 2018 and is projected to grow at the highest CAGR by 2023. As these stores are easily accessible, consumers find it an economical alternative. The different types of conventional stores considered for the study include grocery stores, mass merchandisers, warehouse clubs, and online retailers. The market in North America is driven by the high awareness and consumption of gluten-free products. In addition, the market growth is projected to increase due to the increasing number of anticipated celiac patients, which is estimated to double every 15 years (Source: The Center for Celiac Research). Banking on these factors and the requirements of consumers, leading manufacturers are focusing on developing an extensive gluten-free product portfolio in the region. The European market is projected to grow at the highest CAGR from 2018 to 2023. Majority of the region’s populace has increasingly been adopting gluten-free diets due to various health benefits associated with them. This lifestyle change has opened up several market opportunities, not only for numerous global gluten-free product brands to enter the region, but also for many local patisseries, bakeries, and confectioneries to be able to tap into this consumer space. The relatively high costs of gluten-free products over conventional gluten-containing products and formulation challenges faced by manufacturers are the major restraints for the growth of this market. The global market for gluten-free products is dominated by large-scale players such as The Kraft Heinz Company (US), The Hain Celestial Group, Inc. (US), Pinnacle Foods Inc. (US), General Mills, Inc. (US), and Kellogg Company (US). Hero AG (Switzerland), Barilla GER Fratelli SPA (Italy), Pasia Plc (Finland), Dr. Schar AG/SPA (Italy), Farmo SPA (Italy), Freedom Foods Group Limited (Australia), Genius Foods (UK), Enjoy Life Foods (US), Norside Foods Ltd. (UK), and Warburtons (UK) are other players that hold a significant share of the market. 7.3 The Hain Celestial Group, Inc.
12.2 The Hain Celestial Group, Inc.